Support for saving local entries before publishing.Saving your writing copy to prevent data loss, at configurable intervals. Although as of blog time there were only two binaries available for Linux and one for windows. To install on ubuntu. You are going to add a third party repository popularly called PPA To your system. This is not hard. First we download and add the key for the repository we are about to use and add it to how system. First your start bilbo ( like you don’t know that already hehe) once installed you will find it under the Internet section of your application menu. Type in the URL of your blog then enter your blogs username and password and click the Auto Configure button. In my case it was http://ubuntunigeria.wordpress.com and i clicked the Auto Configure button. 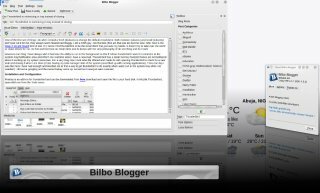 Then Bilbo would work its magic and Auto configure the settings for the blog. If all goes well (and it always did in my case) The dialog box would now look like this. Once your blog is configured and loaded up. you would see a page which looks like this. It support multiple blogs hence you can setup more than one blog at a time. If you are working on a blog post, you can always tell it to save locally, like as i was writing this post, i got disconnected, if i was using the web interface i might have lost some of my works or would have to wait for the Internet to get back before i continue. With bilbo i just told it to save my work locally and continued working. Bilbo also supports tabs you can edit more than one blog at a time with it just by opening a new tab. Most importantly i found bilbo to be very stable, its doesn’t slow down on me or crash on me. i never experience on crash with it. There is just so much to talk about Bilbo you would have to give it a spin to see your self. 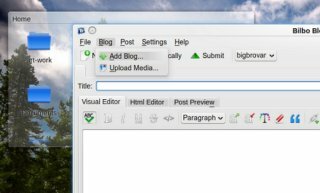 Hey Buddy!, I found this information for you: "The Ultimate Blogging Client for Linux". Here is the website link: http://bigbrovar.aoizora.org/2009/09/06/the-ultimate-blogging-client-for-linux/. Thank you.